The design of a finished cartoon illustrates five scenes from the later life of the Byzantine general, Belisarius (ca.505-565), of Macedonia. 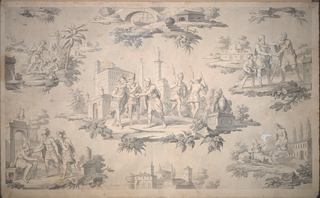 On upper left, Belisarius' dream; upper right, Belisarius recognizing a friend; center, Belisarius setting free the Visigoths; lower left, Belisarius begging alms at the gates of Constantinople; and lower right, Belisarius' dream of justice. A schematic substitution by the artist is pasted in the upper center of the composition.